We Buy Bulk Trichlorotrifluoroethane Refrigerant! Get Fast Cash for Trichlorotrifluoroethane Refrigerant: Looking for a quick way to get rid of your new/used refrigerant gas? We can give you cash quickly & take care of all of the arrangements. Just contact us today! 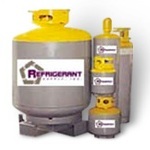 Why sell your trichlorotrifluoroethane refrigerant to us? We offer a hassle-free, turn key solution so you can get cash for your refrigerant quickly!